‘Stage Coachman’ by George Cruikshank, The Gentleman’s Pocket Magazine, 1827. This post is about my five-greats grandfather Isaac Batten (1790-1843). A minor celebrity of his day, as driver of the London-Cambridge stagecoach ‘The Times’ he helped to establish the early 19th century stereotype of the big, fat, Cockney, hard-drinking ‘swell’ coach driver or dragsman; a popular stock character that later appeared in works by both Charles Dickens and Walt Disney. After hanging up his coachman’s whip in 1840 Isaac became a publican, just like his fictional counterpart in the Pickwick Papers. The doors of his old pub in north-west Essex are still open today. Caricature of ‘the swell coachman’ from The Gallery of Comicalities (Part II), satirical print, London, 1832. © The Trustees of the British Museum and licensed for reuse under this Creative Commons Licence. The introduction, thirty-five years earlier, of coaches which carried passengers in addition to the Royal Mail’s deliveries under armed guard, had revolutionised long-distance transport in England. Faster, less crowded, cleaner and safer (though more expensive) than private stagecoaches, the mail coach was the first reliable timetabled public transport service. The coachman – a tough, rough-and-ready, hail-fellow-well-met endurance sportsman, capable of driving through the night at breakneck speed and remaining cheerful throughout – rapidly became a kind of modern folk hero. “The stage coachman is a careless, jolly dog, in the very nature of whom there is something that smacks, like his own whip, of the dignity of monarchs. He is the elect of the road on which he travels … as he bowls along the road, with rubicund nose, and bang up benjamin [overcoat]. “Survey his importance. To some he gives a cool nod; to others a smile of recognition: but thrice happy is he who is honoured with a passing word. “He has commonly a broad, full face, curiously mottled with red, as if the blood had been forced by hard feeding into every vessel of the skin; he is swelled into jolly dimensions by frequent potations of malt liquors, and his bulk is still further increased by a multiplicity of coats, in which he is buried like a cauliflower, the upper one reaching to his heels. His waistcoat is commonly of some bright colour, striped, and his small-clothes extend far below the knees, to meet a pair of jockey boots which reach about half way up his legs. “All this costume is maintained with much precision; he has a pride of having his clothes of excellent materials; and, notwithstanding the seeming grossness of his appearance, there is still discernible that neatness and propriety of person, which is almost inherent in an Englishman. There’s some evidence that the compelling composite individual described above was based – at least in part – on my five-greats grandfather. Or, at the very least, that Isaac Batten’s appearance and demeanor fitted the existing stereotype so perfectly that he became the living embodiment of the ‘swell coachman’ and helped to popularise a new stock character in English literature and caricature. As rough as heart desired. Of sense, of nonsense, and of drollery. – Northampton Mercury, 8 May 1830. I don’t believe it really was – Isaac Batten was alive and well in 1830 and at the peak of his notoriety, and the humour seems a little coarse and inappropriate for a genuine memorial inscription in the first half of the 19th century. The somewhat puerile rhyme Batten / fat ’un was perhaps too obvious to resist, and it’s telling that essentially the same joke was made in another satrirical poem about well-known coach drivers, written by ‘Rowton’ (pseudonym of some Cambridge wag) and published in another newspaper earlier the same year. (12) I suspect that the ‘tomb-stone’ poem was just a vehicle for a cheap pun on Isaac’s surname and a joke at the expense of his expanse. It seems that an important part of a coachman’s public persona was the capacity for the intake of impressive amounts of alcohol. Partly this must have been necessary to keep warm on top of a speeding mail coach in the middle of a winter’s night! Partly it must have resulted from their working ungodly hours and taking all of their meals in coaching inns. Partly there seems to have been a sense of pride amongst coachmen in having, and displaying, huge appetites for wine, women, tobacco, roast beef, and song. Mail coach pillar, near Llandovery. © Copyright shirokazan and licensed for reuse under this Creative Commons Licence. ​There is a memorial to the inevitable result of all this boozing at the reins, on the A40 between Sennybridge and Llandovery in Wales. On the night of 19 December 1835, mail coachman Edward Jenkins – well refreshed after a lightning-quick change of horses at the most recent coaching inn – overturned at full gallop and plummeted down 121 feet of Welsh hillside, his coach smashed to smithereens at the bottom. – Sporting Magazine, April 1829, p. 418. The ‘Cambridge Telegraph’, a competing London-Cambridge coach, which ran from the White Horse, Holborn. Hand-coloured aquatint, 1825. – Bell’s Life in London and Sporting Chronicle, 18 March 1827. ‘The Coachman’ from Disney’s Pinocchio (1940). Walt Disney’s interpretation of Collodi’s original character L’Omino (‘The Little Man’) from Le avventure di Pinocchio (1883) was influenced by the ‘swell coachman’ trope of English caricature – most noticeably, in his Cockney accent and box-coat attire. © The Walt Disney Company. This low-resolution screenshot has been reproduced here for the purposes of criticism or review. Isaac’s wife Charlotte Batten died at her home in Cambridge on 24 March 1835, aged forty-six. (15,24) Isaac carried on as lead driver of the Times for about another five years. 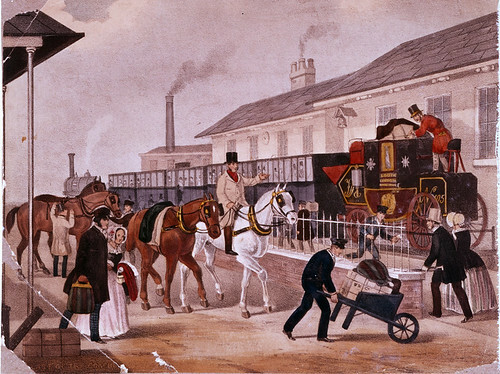 The newly-developed railways had begun to carry mail in and out of London in the 1830s, and by the end of that decade the writing was on the wall for the mail coach service, which could not hope to compete with the train on price, speed, capacity, comfort or safety. 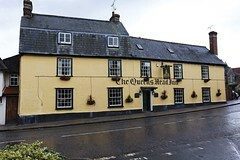 “QUEEN’S HEAD INN, LITTLEBURY, ESSEX. “BEGS respectfully to inform the Nobility and Gentry of the University and Town of Cambridge, and those of the county of Essex, and the public in general, that he has taken the above Inn, which is situate near the domain of Lord Braybrooke, and is about 14 miles from Cambridge, hoping by strict attention to their comfort and convenience, combined with moderate charges, to merit a share of their patronage and support. “N.B.—Dinners ready on the shortest notice, and on the most reasonable terms. – Cambridge Chronicle and Journal, 6 June 1840. Queen’s Head Inn, Littlebury, Essex. © Copyright Dayoff171, all rights reserved. It’s tempting to assume that Isaac’s relatively early death was a result of his lifestyle: the alcohol intake; the obesity. However at least one of Isaac & Charlotte’s children also died young of apoplexy – perhaps the Battens were at an increased risk of stroke through some genetic factor. “MANY must still be living who can remember those good ‘old coaching days,’ when the box-seat of a well-appointed conveyance was considered one of the most enviable of places, and when the coachman happened to be popular, and would hand over the ‘ribbons’ to some ‘gentleman dragsman,’ fresh from Oxford or Cambridge. Many a five-shilling piece, or even a sovereign, was his reward for endangering his passengers’ lives. “To go back some forty years, when two of the best-appointed coaches of the day, the ‘Times Cambridge,’ and the ‘Cambridge Fly,’ one driven by Batten, the other by Fawcett, both celebrated men of that day. It is of the ‘Times’ we have to speak. On its panels was written ‘Tempus fugit;’‡ by no means wrongly applied, for the journey from London to Cambridge, fifty-three miles, was completed within five hours; and it performed the wonderful feat, when running opposition to the ‘Fly,’ of changing horses and driving in and out the yard, of that (in those good old times) celebrated inn Epping Place, in the all but incredible space of one minute! These were pleasant days, gone, alas! never to return. – Baily’s Magazine of Sports and Pastimes, 1881, vol. XXXVI, p. 34.
being loaded on to the back of a train, pre-1845. © Copyright The Postal Museum, all rights reserved. 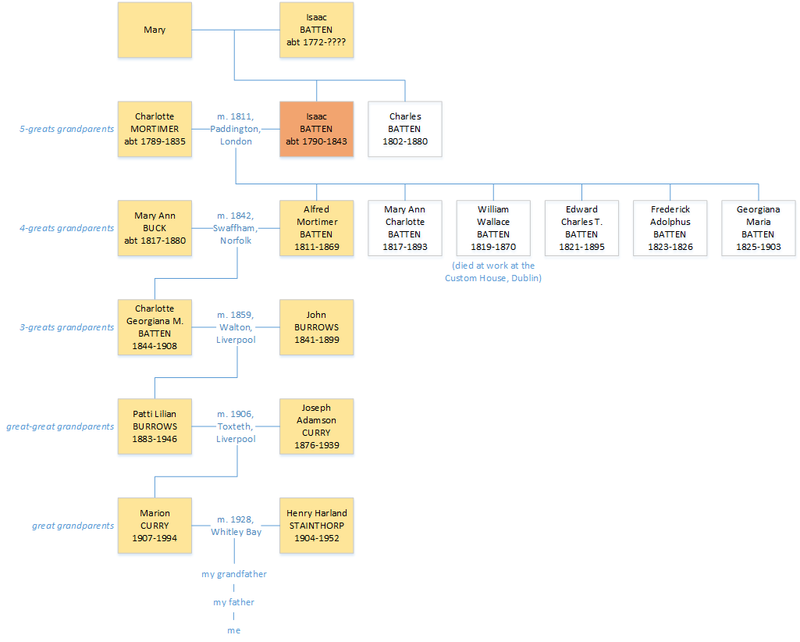 Sketch family tree showing my descent from Isaac Batten & Charlotte Mortimer. I would like to thank a distant cousin T. F. C. Batten whose own research established the link between Isaac Batten of Northampton/Cambridge and his likely parents Isaac and Mary in London; also for the fantastic and generous hoard of digitised documents, articles, and ideas. Thanks also to the members of the RootsChat family history forum for suggestions for further research. Version 1.2, updated 18 November 2017. England and Wales, death certificate (certified copy); General Register Office, Southport. Personal e-mail; privately held by the author. “FreeReg,” database, FreeReg (http://www.freereg.org.uk/ : accessed 2 September 2016). St James’ Church (Paddington, London, England), parish registers; digital images, Ancestry Library Edition (http://www.ancestrylibrary.com/ : accessed 2 October 2015). “London, England, Land Tax Records, 1692-1932,” digital images, Ancestry Library Edition (http://www.ancestrylibrary.com/ : accessed 29 June 2016); London Metropolitan Archives. St Giles’ Church (Northampton, Northamptonshire, England), parish registers; digital images. “1851 England Census,” digital images, Ancestry Library Edition (http://www.ancestrylibrary.com/ : accessed 18 December 2015); The National Archives, Kew. “1861 England Census,” digital images; The National Archives, Kew. St Mary’s Church (Welford, Northamptonshire, England), parish registers. The Gentleman’s Pocket Magazine; and album of literature and fine arts (London: Joseph Robins, 1827); digital images, Hathi Trust (https://babel.hathitrust.org/ : accessed 9 May 2016). Northampton Mercury, 8 May 1830. Bell’s Life in London and Sporting Chronicle, 17 January 1830. 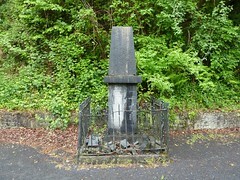 Watkins, Graham, Mail coach monument, 8 March 2011 (http://www.grahamwatkins.info/ : accessed 26 September 2016). “Cambridgeshire Baptisms,” database, Findmypast (http://www.findmypast.co.uk/ : accessed 23 May 2016); Cambridgeshire Family History Society. “Cambridgeshire Burials,” database; Cambridgeshire Family History Society. “UK, Poll Books and Electoral Registers, 1538-1893,” digital images, Ancestry Library Edition (http://www.ancestrylibrary.com/ : accessed 19 December 2015); London Metropolitan Archives and Guildhall Library. Cambridge Chronicle and Journal, and Huntingdonshire Gazette, 30 May 1840. William Wallace Batten. Entry papers for service as an Excise man. The National Archives, Kew, ref. CUST 116/6/21. The Cambridge University calendar for the year 1829 (printed by J. Smith for J. & J.J. Deighton, 1829). Sporting Magazine, April 1829, vol. XXIII N.S., no. CXXXIX, pp. 414-419. Bell’s Life in London and Sporting Chronicle, 18 March 1827. Courier [London], 23 October 1830. Cambridge Chronicle and Journal, and Huntingdonshire Gazette, 27 March 1835. Bell’s Life in London and Sporting Chronicle, 21 March 1841. “1841 England Census,” digital images; The National Archives, Kew. Cambridge Chronicle and Journal, and Huntingdonshire Gazette, 15 April 1843. Essex Standard and General Advertiser [Colchester], 21 April 1843. Chelmsford Chronicle, 1 September 1843. Baily’s Magazine of Sports and Pastimes, 1881, vol. XXXVI, p. 34. Church of St Peter and St Paul (Swaffham, Norfolk, England), parish registers; digital images, Findmypast (http://www.findmypast.co.uk/ : accessed 26 September 2016). Liverpool Mercury, 20 March 1869, p. 5. Anderson, Robert and Anderson, Rose, Toxteth Park Municipal Cemetery inscriptions (http://www.toxtethparkcemeteryinscriptions.co.uk/ : accessed 3 October 2015). England and Wales, marriage certificate (certified copy); General Register Office, Southport. “1891 England Census,” digital images; The National Archives, Kew. St Luke’s Church (Chelsea, London, England), parish registers; digital images. “FreeBMD,” digital images, FreeBMD (http://www.freebmd.org.uk/ : accessed 29 March 2016); General Register Office, Southport. Ireland, Department of Arts, Heritage, Regional, Rural and Gaeltacht Affairs, “Civil Records,” digital images, Irish Genealogy (https://civilrecords.irishgenealogy.ie/ : accessed 2 October 2016). Evening Freeman [Dublin], 4 July 1870. “Calendars of Wills and Administrations 1858 – 1920,” digital images, The National Archives of Ireland (http://www.willcalendars.nationalarchives.ie/ : accessed 2 October 2016). “Dublin Headstones,” digital images, Ireland Genealogy Projects Archives (http://www.igp-web.com/IGPArchives/ire/dublin/photos/tombstones/ : accessed 1 October 2015). “Find a will: Wills and Probate 1858 – 1996,” digital images, Gov.UK (https://probatesearch.service.gov.uk/ : accessed 1 July 2015); National Probate Calendar. I’m piecing together the family of Benjamin Hancock (poss. 1780 – poss. 1814) and his wife Margaret (1782 – 1827) née probably Tunstall, of Oldcot, Wolstanton, Staffordshire, in the early 19th century, and three of their children who all ended up in Ipswich, Suffolk by the 1830s. Their daughter Sophia is the great grandmother of the actor and filmmaker Charlie Chaplin (as described on the website of William Addams Reitwiesner); their son Thomas married into the same Chaplin family. Another daughter, Emma, ties in to my Corr family. There are a lot of Hancock families in and around the parish of Wolstanton at this time, including several people called Benjamin Hancock. The parish registers for this area from 1789-1812, available in Findmypast’s Staffordshire Collection, are pre-printed forms filled in by a single hand; some entries are very sparse and seem to be missing details. Example of the parish registers for the chapel of St James, Newchapel, on pre-printed forms, available in Findmypast’s Staffordshire Collection. 17th January 1808 – Margaret Anne Hancock, dau. of Benjamin and Margaret, bapt. St James, Newchapel – resident at Old[cot]. She died aged 15. 18th March 1810 – Thos. Tunstall Hancock, son of Benjamin (mother’s name not given), bapt. St James, Newchapel – resident at Oldcot. 24th May 1812 – Theophilus* Hancock, son of Benjamin and Margaret, bapt. St James, Newchapel – resident at Old[cot]. He died aged 4. 13th May 1804 – Sophia Hancock, dau. of Benjamin and Mary, bapt. St Lawrence, Biddulph. 30th January 1814 – Benjamin Hancock, aged 34 (born abt 1780), son of John and Esther, bur. St James, Newchapel – resident at Oldcot. 12th November 1816 – Theophilus Hancock, aged 4, son of Benjamin and Margaret, bur. St James, Newchapel – resident at Oldcot. 10th April 1822 – Margaret Anne Hancock, aged 15, dau. of Benjamin and Margaret, bur. St James, Newchapel – resident at Oldcot. Portrait of Charlie Chaplin as a young man, Hollywood, circa 1916 (public domain image). 29th April 1834 – Sophia Hancock mar. Shadrach Chaplin, St Margaret, Ipswich.5 Shadrach is the great grandfather of Charlie Chaplin and the brother of Phylorata (above). 1841 census – Thomas Hancock, hawker, Cox Lane, Ipswich. 1841 census – Emma McDonald, hawker, Hythe, Maldon, Essex. 1851 census – Thomas T. Hancock, hawker, Bond Street, Ipswich – born Wolstanton, Staffs. 1851 census – Emma McDonald, hawker, Brickendon, Herts – born Goldenhill, Staffs. Are the Benjamin and Margaret who married in Newcastle in 1802 the same Benjamin and Margaret who were the parents of Sophia, Thomas T., and Emma? Did the father Benjamin die in January 1814? On the baptism record of Emma Hancock in May the same year there is no mention of her father being deceased. Are the Sophia and Margaret baptised in 1804 and 1806 respectively also the children of Benjamin and Margaret, despite the mother’s name on the register being recorded as Mary, and despite the first baptism taking place in Biddulph rather than Newchapel (or Tunstall where ‘our’ Sophia was apparently born)? If they were, then what happened to the Margaret baptised in 1806? Why the mass move from Staffordshire to Ipswich by 1833-34, following their parents’ deaths? Sketch family tree of the Hancock family of Oldcot, Staffordshire and Ipswich. The chart also includes my great grandfather Frank Corr who is not descended from the Hancocks. “Staffordshire Marriages” (digital images, Findmypast, http://search.findmypast.co.uk/ : accessed 13 ‎October ‎2015; citing Staffordshire and Stoke-on-Trent Archive Service). “1851 England Census” (digital images, Ancestry Library Edition, http://www.ancestrylibrary.com/ : accessed 7 ‎July ‎2015; citing Census Returns of England and Wales, 1851, The National Archives, Kew). “Staffordshire Baptisms” (digital images, Findmypast, http://search.findmypast.co.uk/ : accessed 19 ‎September ‎2015; citing Staffordshire and Stoke-on-Trent Archive Service). “Staffordshire Burials” (digital images, Findmypast, http://search.findmypast.co.uk/ : accessed 17 ‎October ‎2015; citing Staffordshire and Stoke-on-Trent Archive Service). “England Marriages, 1538–1973” (database, FamilySearch, https://familysearch.org/ : accessed 14 June 2016; citing FHL microfilm 918,523). Parish of St Mary at the Quay, Ipswich, banns of marriage, Felix Corr and Emma Handcock, March 1834, p. 9, no. 44; photocopy supplied by Suffolk Record Office, 13 October 2015. Parish of St Mary at the Key [sic], bishop’s transcripts, Felix Corr and Emma Handcock, 1 [April] 1834, p. 54, no. 160; photocopy supplied by Suffolk Record Office, 13 October 2015. “1841 England Census” (digital images, Ancestry Library Edition, http://www.ancestrylibrary.com/ : accessed 7 ‎July ‎2015; citing Census Returns of England and Wales, 1841, The National Archives, Kew). Reitwiesner, William Addams, William Addams Reitwiesner Genealogical Services (http://www.wargs.com/ : accessed 13 October 2015), Wood, Michael J., “Ancestry of Charlie Chaplin”. Paul Harland Stainthorp (paul@paulstainthorp.com). Version 1.2, updated 15th June 2016.